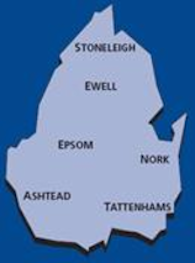 The Epsom and Ewell parliamentary constituency covers the Borough of Epsom and Ewell, Ashtead, Nork, Tattenhams. We campaign and work for the local community across an area that runs from Worcester Park to the A217 and the M25, and includes the whole Epsom and Ewell Borough, Ashtead, Nork and Tattenhams. Our aim is to play an active role in the community across the constituency, as well as to provide it with effective representation on a national stage. We are starting a Policy Forum; this will allow us to discuss key government policies such as the environment, enabling us to provide direct feedback to Ministers and the No 10 Policy Unit to shape the future. We would be pleased to hear from you if you have problems, issues or are keen to get involved.